New name underlines ambitions of growth and sustainability. The internet of things. You don’t have to go to Silicon Valley to discover it. Since years, a team of experts have specialized in building automation with the most advanced technology. In Kortrijk, near the French Border in Flemish Belgium, ELEKTRO.MAT and DOMOTIC.LOUNGE have offered technology and services on energy saving and comfort for all types of non-residential buildings. 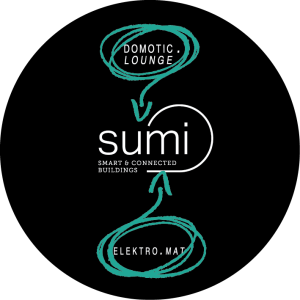 Starting today, they continue under one new brand: Sumi – Smart & Connected Buildings. Intelligent systems in buildings (e.g., Lighting, HVAC, Alarm, Acces, AudioVisual) are rapidly being adopted. Unfortunately, they are often operating in complete isolation, without much effort towards integration or coordination. Sumi delivers a long awaited solution for this problem. Hence, Sumi means the Sum of integration, bringing together all intelligence in buildings. To date, building owners are overly dependent on costly contracts with one supplier. Sumi vows to brand independent and open standards, such as BACNet, KNX, LON, Modbus, MQTT, offering customers guaranteed flexibility for the future. This is exemplified by Sumi CEO Verdonckt chairing the Belgian branch of KNX Professionals, the word wide building automation standard. However, Sumi’s central focus is not technology. Instead, Sumi aims to understand what technology means for the end-user. While technology may quickly evolve, the Sumi team listens to the fundamental needs of the customers, guides them through the forest of innovative techniques and develops for them easy to understand, user-friendly solutions. Through this type of integrative usability, Sumi makes a unique difference: Sumi not only ensures energy efficiency, but more importantly enables YOU to regain control over excessive maintenance costs instead of your suppliers. Surprisingly, what did we find that CEO’s of our customer – building owners appreciate the most ? The Peace-of-mind for their staff. Facility management gets a real time and state-of-the-art control platform overseeing all techniques in your buildings, even in the old ones. This allows other collaborators to concentrate on their core tasks, without being distracted or hassled by all sorts of minor technical issues any longer. In sum, sumi delivers the sum of genuine comfort and real return on investment. The SHOPCONTROLLER is the amazing innovative Energy Management Tool for RETAILERS where we, and many partners, worked on very hard the past few years. One exceptionally smart web application shows an overview of all the details relating to energy, water and maintenance in a branch network. It can be deployed instantly in any existing store. Not only do CEOs, CFOs and facility managers get all the relevant information and bench marks from every branch on their screen, they can interfere and adjust immediately as well. No time? No problem. The SHOPCONTROLLER automatically adjusts itself in real-time. This really is saving costs on energy, water and maintenance interventions. Still in need of arguments? Average energy savings: -25.2%. Average payback: 2.1 years. More information on www.shopcontroller.eu. Do you know any Retail Managers ? Please forward this information or inform me about their possible interest. Do you have an idea for any other application for multi site energy management in other areas like schools, local authorities, social housing, etc…. Let us know : jo@sumismart.com. We only have one objective : reduce energy consumption with double digits for all types of non-residential buildings.